The last week has been a strange combination of rushing and laziness, excitement and relaxation. I’ve been getting everything sorted for India, which has been difficult only because I’m a bit nervous about travelling alone, and have been transferring those worries to my preparation. 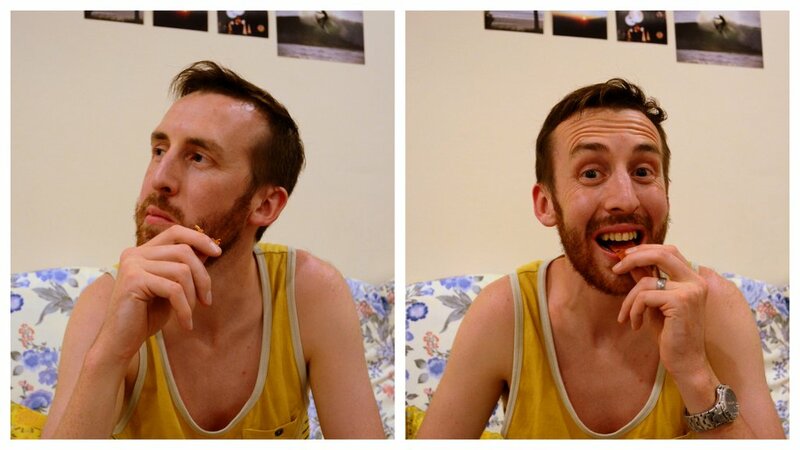 I’ve been feeling a little sick from the anti-malarial drugs that I couldn’t decide whether to take or not. I’ve been hanging with The Engineer and our friends before we all get into the travel filled ‘summer’ (summer will always be Christmas time to me, but the majority of expats here are Northern Hemisphereans, so everyone jets off in July and August for trips home.) I’ve been playing too much Candy Crush Saga with The Engineer. I’ve been keeping up with yoga, and barely keeping up with writing. And now, I’m ready to go. 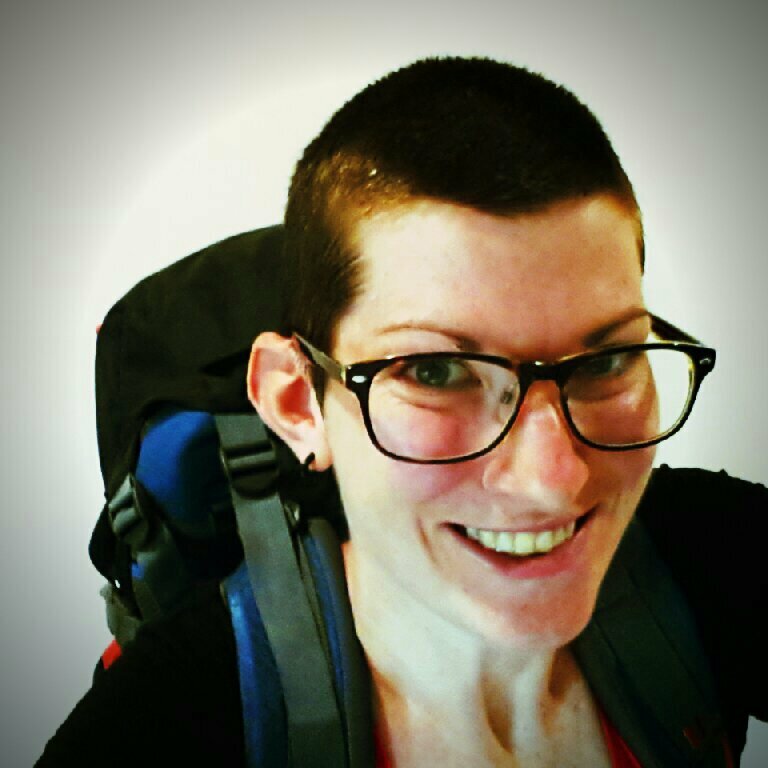 My bags are packed, my information’s printed, my carry-on satchel is perfectly organised, my head is freshly shaved. I am so very excited to see my sister, stay at some amazing places, and experience the craziness that is India. That craziness makes me a little nervous too. I’m glad that I’m not driving, but I know I’m not a great passenger sometimes. I’m not a haggler, and I’m nervous about getting ripped off (although things are so cheap that part of me just doesn’t care!) But I’m happy to report that at the moment, the excitement is winning. I’ve got my backpack and my excited face on. I’m ready to go! In a few hours, I get on a plane to Kuala Lumpur, wait there a couple of hours, and then get on another plane to Kochi/Cochin. I get there, sleep in a stupidly overpriced airport hotel, and then tomorrow morning make my way to Fort Cochin to meet my sister. We hang and chat and catch up for a couple of days, and she teaches me all she knows about travelling in India (with two months under her belt, she’s my resident expert). Then we head to the hills for a yoga retreat for 7 nights. After we are suitably relaxed, we do some other stuff for five days. We really don’t know what yet, but we’ll work it out. It’s pretty much the perfect itinerary! I don’t know what the internet will be like, and my only electronic device is a smart phone, so I probably won’t be blogging much. But I doubt I’ll be able to resist a bit of Facebooking, so you can catch me over there (the link’s in the side bar). We’ve done plenty of seafood challenges before. We’ve tried some dried things too. It may not seem surprising to you that we’ve never combined the two, but when you’re in Brunei, it really is a bit of a surprise. Dried fish is everywhere. Dried anchovies on the side of your nasi lemak. Piles of dried fish that you can’t help but smell at the market. Aisles full of dried fish snacks at the supermarket. Dried shrimp and shrimp paste in your practically everything. 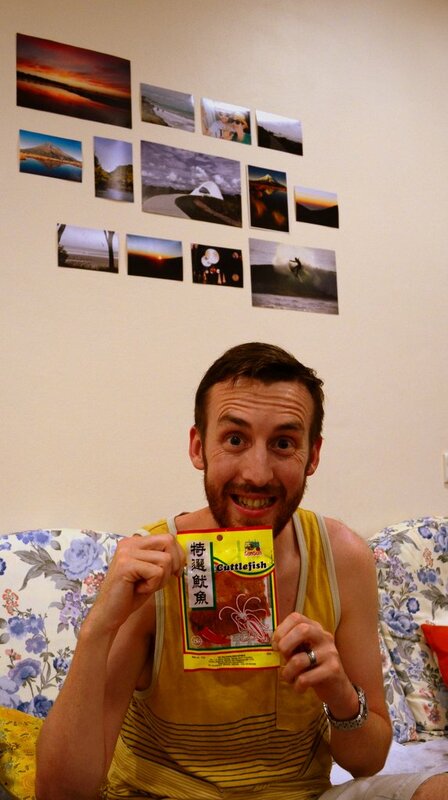 But for week 16, I finally brought dried fish into our challenges by challenging The Engineer to some dried chilli cuttlefish (I actually had the choice of chilli, lemon, or plain. But chilli was the winner on the day). Just your average dried fish snack. This one was pretty easy logistically. When we were at the supermarket, I just popped the smallest packet I could find in the trolley. We paid the 80 cents, and got on with our day. Later in the evening, I pulled it out, forced encouraged The Engineer to sit down, ripped open the packet, snapped a quick couple of pictures, and he dug in. The Engineer is quite excited about the Cuttlefish. Or maybe about the new “home” photo display on the wall. ‘I can’t just blog hmmmm‘ I replied. So he elaborated a little more. He said it was quite sweet, super chewy, and really not that bad. And he wasn’t lying. The flavour is not something I came across much in New Zealand, but is pretty popular here. Quite sweet, a little salty, and definitely fishy. Sambal (chilli paste with shrimp) is everywhere, and has a similar flavour (but usually a LOT more spice). You can also get a huge range of snacks with this taste. 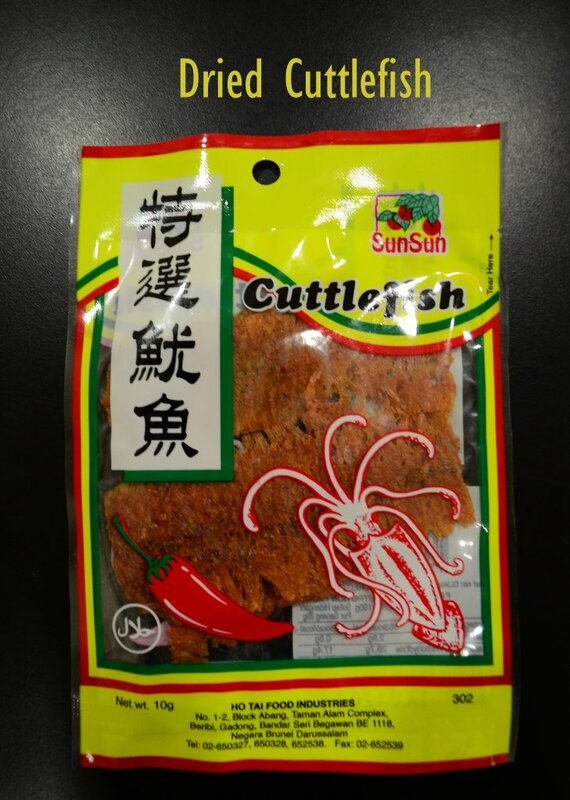 Including, apparently, dried cuttlefish. The Engineer gives the dried cuttlefish a go. Today you can find me talking yoga at Modern Alternative Health. 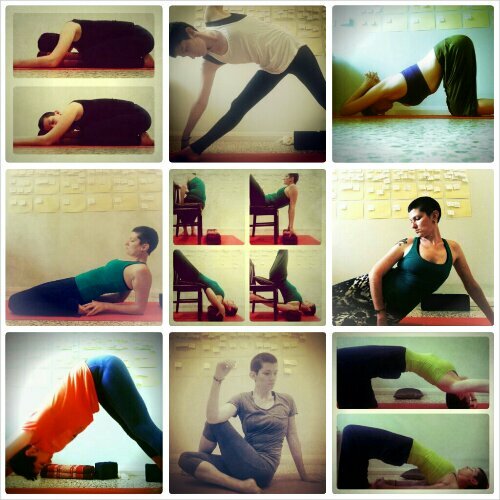 I’ve been thinking a lot about it lately, and my yoga every damn day challenge has really improved my practice. In this month’s post I share some of the things I learned about practicing yoga at home and how you can start doing it too (if that floats your boat). The last month has been busy in the Engineer household. What with two sets of Couchsurfers, medical appointments every few days that are a one-and-a-half hour drive away, a visit from The Engineer’s parents, and a holiday to Kuching, we haven’t had much time to sit back and think. And we haven’t put our usual effort into our weekly challenges. We’re still trying plenty of weird and wonderful things (coconutty donuts from the market, Sarawak Laksa, red bean paste buns, char siu pau, rojak, mee jawa), but the actual challenges have been a little slap dash. Me buying and cooking fresh crabs. The crabs may not have been too scary in their plastic bag, but the size of those nippers still impressed me. And I still had no idea how to cook them. 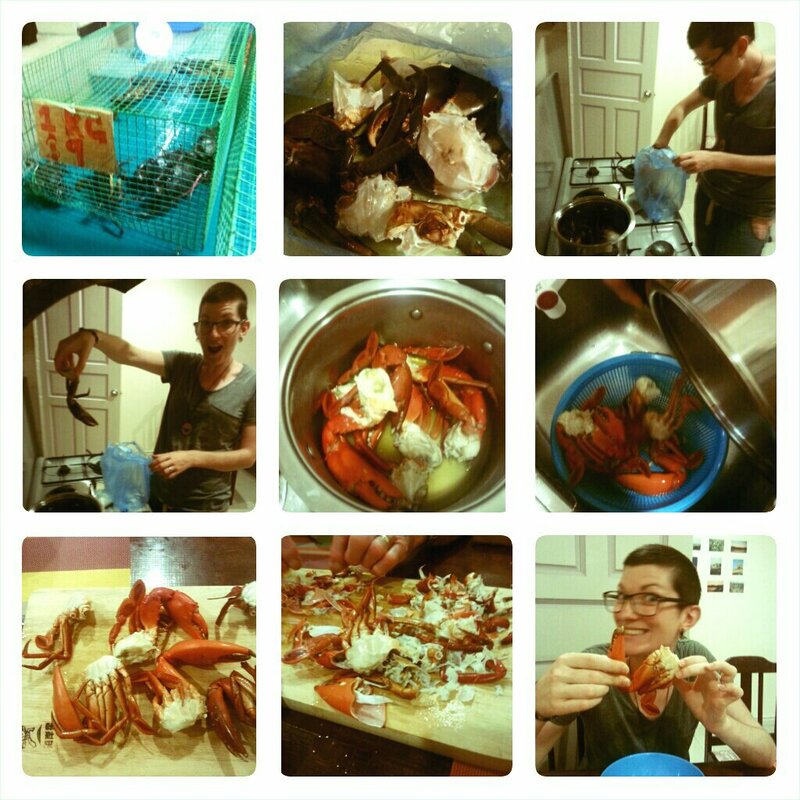 Thankfully, my mother-in-law is a bit of a crustacean cooking pro after years of my father-in-law diving for crayfish. So they got me on track. And 10 minutes later, we had a board of freshly cooked crab. None of us had really been in the mood for a starter, but once we dug in, our moods changed. That crab was delicious! And those giant nippers meant there was plenty of meat. A fantastic starter for only $5. I think to do this challenge justice, I need to try again, and actually do the killing myself (I’ve heard that having a crab race first is kinda fun too). But I’m not sure that I’ll actually be able to refuse when he offers to clean and cut them for me. They were so easy, and so tasty. And those nippers…! The next week when it came to challenge time, we were in Kuching. And we were so busy trekking around the national park, and being excited about the Rainforest World Music Festival, that the challenge slipped our mind. But thankfully, we remembered just as we were about to sit down for dinner at a Steamboat restaurant. So the dinner became our challenge. This is (clearly) something we would have done, challenge or no challenge. But it was also a little challenging. When we arrived, the waiter turned on our grill plate, topped up our water, brought us drinks, and said ‘Help yourselves’. This was great, but we didn’t really know HOW to help ourselves. We had a look around us to see what everyone else was doing, scanned the buffet, and then just went nuts. We weren’t sure we were doing the “right” thing most of the time, but we had delicious boiled prawns, tasty chicken, okra and greens, noodles, boiled eggs, broccoli, seaweed, mushrooms, and many many more. So we thought we did pretty well. The true challenge came when we saw the vast array of fish balls. The Engineer and I are fans of fish balls. But at home, we pretty much just get the plain standard ones. Here, there were different colours, different shapes, and so many things we just had no idea about. So of course, we grabbed a big plate of them, and got stuck in. We waited until the end, because we didn’t want to wreck the broth for the others (who were not so keen on the idea of fish balls). And then we gave them a go. We still have no idea what most of them were, but there were pink ones and orange ones, flat ones and tube shaped ones, yummy fishy ones and ones that tasted like glue. It was a fun finish to an interesting meal. 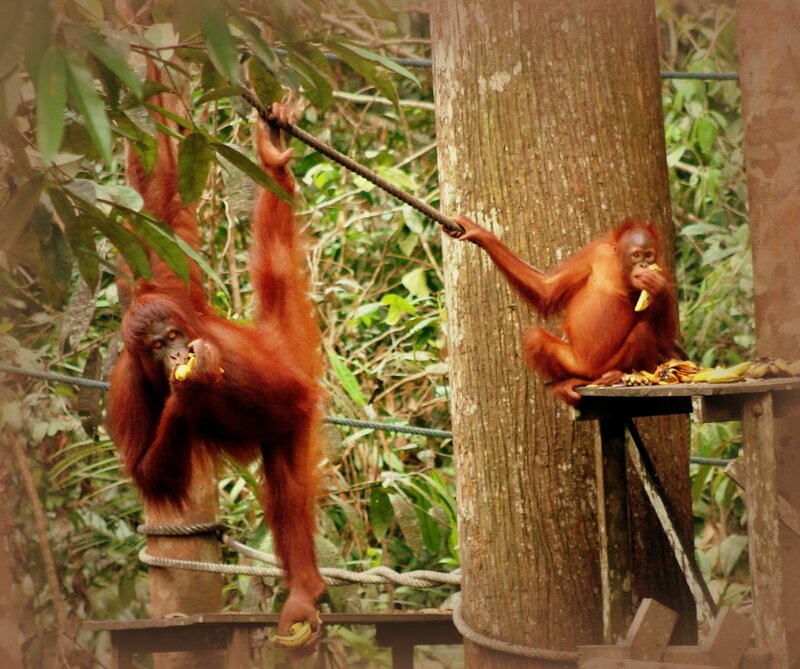 Orangutans with bananas at Semenggoh Wildlife Park, Kuching. Photo by Daniel O’Connell, edited by me. After five days of being out and about, we’re home again. Kuching was amazing. The holiday was amazing. 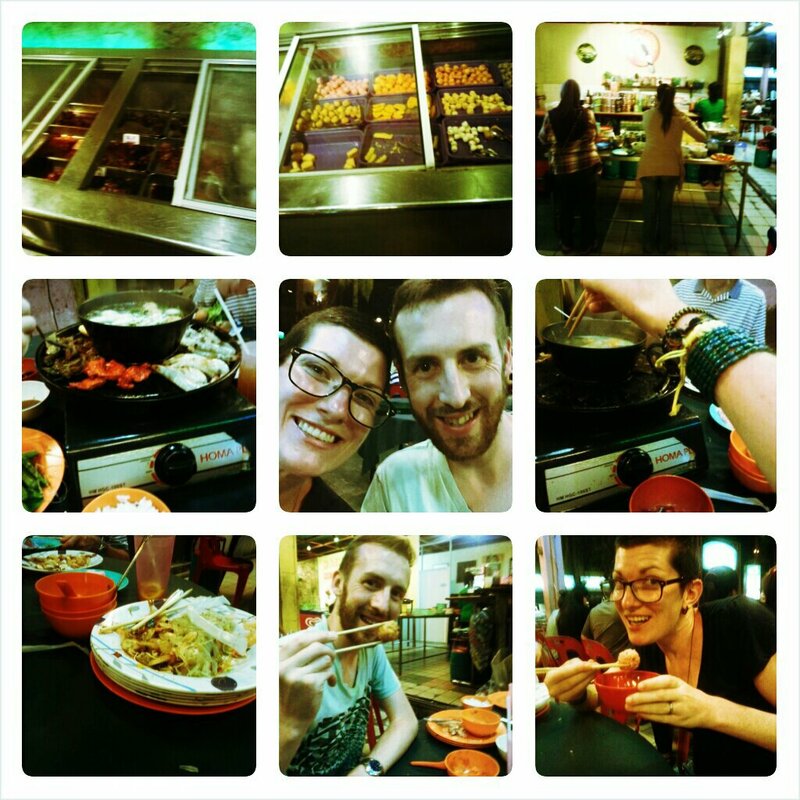 We hung out with the orangutans at Semenggoh Wildlife Sanctuary, walked and swam at Bako National Park, visited the awesome Rainforest World Music Festival at the Sarawak Cultural Village, ate at busy hawker centres, wandered the waterfront, shopped at big airconditioned malls and small crowded shops, enjoyed foot reflexology and shiatsu back massages, drank our weight in Ice Lemon Tea, and generally enjoyed ourselves. Being home is also amazing. After five days of walking, going, moving, socialising, I am ready for my alone time. Apparently I’ve gotten used to that over the last three months. I am ready for some yoga that isn’t crammed into a tiny hotel corridor, ready to do some more writing, and ready to just stop. There will be more stories to come. Stories of challenges and experiences. Stories with tips and ideas. Stories with photos. But for now, I’m going to stop.